"Northern Kingdom" redirects here. For the original kingdom of Saul, David, and Solomon, see United Kingdom of Israel. For the modern state, see Israel. Solomon had greatly displeased God with his worship of foreign gods, which were mainly the gods of his foreign wives and concubines (of which he kept a thousand). For that reason, God intended to split the kingdom of Israel apart. He granted Solomon this mercy, for David's sake: that Solomon would not live to see this happen. Jeroboam, son of Nebat and member of the tribe of Ephraim, was one of Solomon's ranking officers – in fact, Solomon made him his chief foreman for his many building projects. Roughly nine years before the revolt, Ahijah the Shilonite, a prophet, met Jeroboam along the road. In a graphic demonstration of Divine intent, Ahijah took off his robe, tore it into twelve pieces, and invited Jeroboam to take any ten. Solomon issued a warrant for Jeroboam's arrest and execution, but Jeroboam fled to Egypt and sought asylum under Pharaoh Shishak. This happened in 978 BC, according to Ussher. The Biblical authority for this would be Ezekiel 4:5 , which says that all of Israel had a 390-year period of "iniquity" for which it must be punished. That period ended with the Fall of Jerusalem in 588 BC, again according to Ussher. Jeroboam did not return until after Solomon was dead. Solomon died after a forty-year reign. His son Rehoboam prepared to receive the crown at Shechem. Jeroboam heard about the death of Solomon and came back from Egypt. At first, Jeroboam simply pleaded with Rehoboam to lighten the national tax burden, which Solomon had made very heavy. Rehoboam spitefully said that he would make the burden even worse. The tribes, except only for the tribes of Judah and Benjamin, withdrew their representatives and would have no part of Rehoboam's coronation. Rehoboam sent an officer named Adoram to collect his taxes (literally, tribute), and the revolting tribes people stoned him to death. Rehoboam raised an army, 180,000 strong, to attempt to crush the revolt, but desisted when another prophet, Shemaiah, warned him against such action. 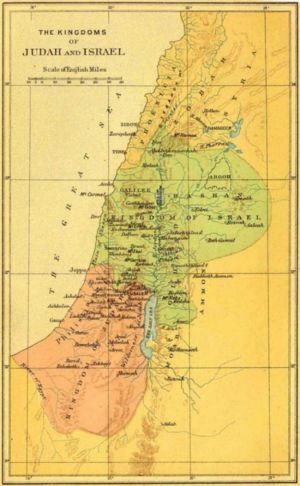 The Kingdom of Israel had a troubled history almost from the beginning. Jeroboam I reigned for twenty-two years, and this actually was one of the longest reigns of a king of the Northern Kingdom. After he died, his son Nadab lasted only a year before a general officer named Baasha murdered him and usurped his crown. Baasha lasted for twenty-four years, but his son Elah suffered much the same fate as Nadab's: he was murdered, and this time his murderer fell to yet another conspirator within seven days. After that, the Kingdom of Israel fell into civil war, with the two sides equally divided, until within four years one side, led by Omri, prevailed. The House of Omri was one of the most troubled and wicked of the dynasties of the Northern Kingdom; its most famous member was Ahab, who with his consort Jezebel was best known for his contest of wills with the great prophet, Elijah. "Thus hath the LORD God shewed unto me; and, behold, he formed grasshoppers in the beginning of the shooting up of the latter growth; and, lo, it was the latter growth after the king's mowings. And it came to pass, that when they had made an end of eating the grass of the land, then I said, O LORD God, forgive, I beseech thee: by whom shall Jacob arise? for he is small. The LORD repented for this: It shall not be, saith the LORD. Thus hath the LORD God shewed unto me: and, behold, the LORD God called to contend by fire, and it devoured the great deep, and did eat up a part. Then said I, O LORD God, cease, I beseech thee: by whom shall Jacob arise? for he is small. The LORD repented for this: This also shall not be, saith the LORD God. Thus he shewed me: and, behold, the LORD stood upon a wall made by a plumbline, with a plumbline in his hand. And the LORD said unto me, Amos, what seest thou? And I said, A plumbline. Then said the LORD, Behold, I will set a plumbline in the midst of my people Israel: I will not again pass by them any more: And the high places of Isaac shall be desolate, and the sanctuaries of Israel shall be laid waste; and I will rise against the house of Jeroboam with the sword. Then Amaziah the priest of Bethel sent to Jeroboam king of Israel, saying, Amos hath conspired against thee in the midst of the house of Israel: the land is not able to bear all his words. For thus Amos saith, Jeroboam shall die by the sword, and Israel shall surely be led away captive out of their own land. Also Amaziah said unto Amos, O thou seer, go, flee thee away into the land of Judah, and there eat bread, and prophesy there: But prophesy not again any more at Bethel: for it is the king's chapel, and it is the king's court. Then answered Amos, and said to Amaziah, I was no prophet, neither was I a prophet's son; but I was an herdman, and a gatherer of sycamore fruit: And the LORD took me as I followed the flock, and the LORD said unto me, Go, prophesy unto my people Israel. Now therefore hear thou the word of the LORD: Thou sayest, Prophesy not against Israel, and drop not thy word against the house of Isaac. Therefore thus saith the LORD; Thy wife shall be an harlot in the city, and thy sons and thy daughters shall fall by the sword, and thy land shall be divided by line; and thou shalt die in a polluted land: and Israel shall surely go into captivity forth of his land. Zachariah finally restored order, but Shallum murdered him, only to be murdered in his own turn by Menahem. Later, Menahem's son Pekahiah also fell to an act of murder by a general officer named Pekah. Pekah held the kingdom for twenty years, but then yet another interregnum supervened upon his death. (Again, Thiele does not account for this.) Hoshea was the last of the kings of the Northern Kingdom, and was the one who lost it to the Assyrians. The following table gives the dates of accession of the kings of the Northern Kingdom. The Ussher and Thiele columns, of course, have vastly differing BC columns. For a further explanation of the I, II, III, and IV columns and the assumptions that form their basis, see here. Further assuming that the twenty-year reign of Pekah dated from the beginning of his tenure as a general rather than from his usurpation of the throne. He therefore dated the reign of Pekah as beginning simultaneously with the reign of Menahem. The Bible gives no warrant for any of the above assumptions. One might argue that the Bible gave no warrant for Jeroboam II's consecutive viceroyship, either—except that if Jeroboam II did not so serve, one would have to accept an eleven-year interregnum between Amaziah and Uzziah, coupled by an eleven-year co-regency between Uzziah and Jotham. Scripture specifically rules out an interregnum, and Occam's razor militates against any co-regency. Thiele evidently was trying to reconcile the stated history of the Northern Kingdom in I and II Kings with generally accepted dates in Assyrian history. But such a foreshortened chronology for the Northern Kingdom (and hence for the Southern) would be difficult-to-impossible to reconcile with the 390-year period of "iniquity" referred to by the prophet Ezekiel. ↑ Ussher, op. cit., pgh. 642. ↑ Ussher, op. cit., pgh. 851. This page was last modified on 2 September 2014, at 22:18.